noted Andrew Mwenda; a renowned controversial journalist critiqued the East Africa regional integration efforts while presenting a paper at the 1st Annual East African Community Conference. The conference was organized to enlighten participants about the EAC — what it is; its core institutions and their functions; its aspirations and dialogue on the upcoming legal, economic and business developments in the EAC. 1. The EAC has opened opportunities for cross boarder investment as well as platform for creation of a unified voice in the international arena. It has enabled member countries to build their comparative advantages, sharpen their industrial efficiency, and act as a springboard to integrate into the world economy. 2. The integration paved way for elimination of tariffs on goods traded within the community and free trade areas, where tariffs on raw materials are 0%, 10% for intermediate goods and 25% for finished goods. 3. There has been an establishment of a single customs territory which has facilitated faster movement of cargo within the market. 4. The introduction of One Stop Boarder posts has reduced the time taken in clearance procedure and enabled member countries to have access to each other’s markets with less encumbrances. According to a recent report from TradeMark East Africa (TMEA), the time to transport a container from Mombasa to Kampala has been halved over the 7 years that TMEA has been implementing its trade facilitation programs. Further reducing from an average of 20 days in 2010 to 10 days’ in 2017. TMEA works closely with the EAC to grow trade and business competitiveness through increased access to markets. In addition to the above, Ms. Clara Mira, Uganda’s Resident Representative; International Monetary Fund, noted that “yes, undeveloped infrastructure is still a major challenge among many others but the challenges cannot down play the achievements over the years and anticipated future achievements. The IMF and East African Development Bank (EADB), who were among key stakeholders pledged to support trade through capacity building and financial support. “In order to allow trade to flow regionally, investment in physical infrastructure such as roads, railways, power lines, air services and telecommunications is necessary”, noted a representative from EADB presenting a paper on the; “The role of EADB in facilitation East African Integration. Sharing experiences of Germany as a member of the European Union (EU), the German Ambassador to Uganda, His Excellency Dr. Albrecht Conz, noted that, political determination is important in the process of integration. Sometimes the egos of heads of member states may affect process but progress must be made. It’s important to analyze that each country has its own dynamics to deal with but the main principles of movement of goods, services, capital ought to be realized. Some stakeholders expressed concern of Uganda’s subscription to several regional economic groupings including the East African Community (EAC), the Southern African Development Community (SADC), the Common Market for Eastern and Central African States (COMESA). Many felt that the overlapping membership of trade agreements has long been promoted by political leaders in speeches, official conferences and formal treaties, but with little or no results on the ground. “We have to fight for prosperity in the global space, we have to trade together, by removing barriers to trade. A local market of 40 million has now become a market to 170 million people. The challenges should not divert us from the overall good of the agenda because there is a significant political will from the heads of member states to commit to the EAC agenda”, noted, Hon. Julius Wandera Magada- State Minister for East African Affairs. 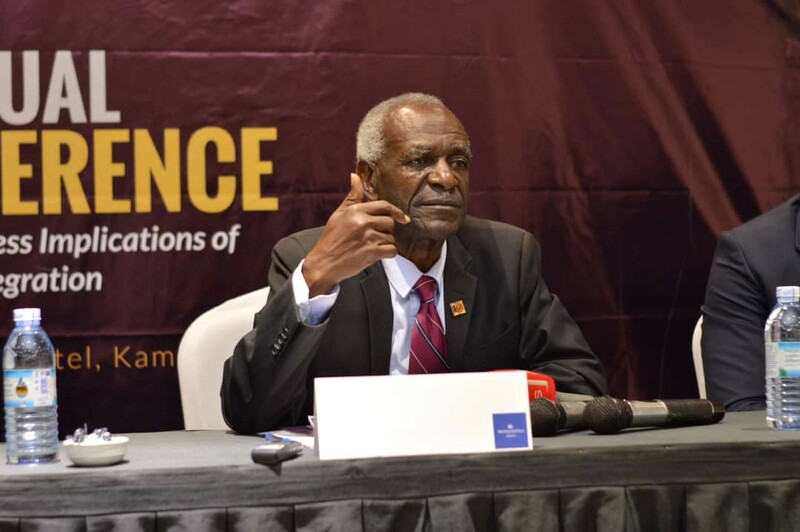 He thanked stakeholders for their commitment to making the integration a reality and congratulated, Former Chief Justice James Ogola for leading this initiative by advocating for regional integration.